The update is set for tomorrow, Jan. 22 at 7am CT.
A strong Fortnite: Battle Royale explosive weapon is likely headed to the vault tomorrow. The Quad Launcher will be removed from Fortnite this week, according to Epic Games design lead Eric Williamson. Since Fortnite’s v7.20 content update is set to be released tomorrow, Jan. 22 at 7am CT, this is the likely time in which the Quad Launcher will be retired to the vault. Coming this week: small tweaks to shield availability, a reduction of mobility (item & vehicle spawn chance), and a few more vaults… including Quad Launcher. 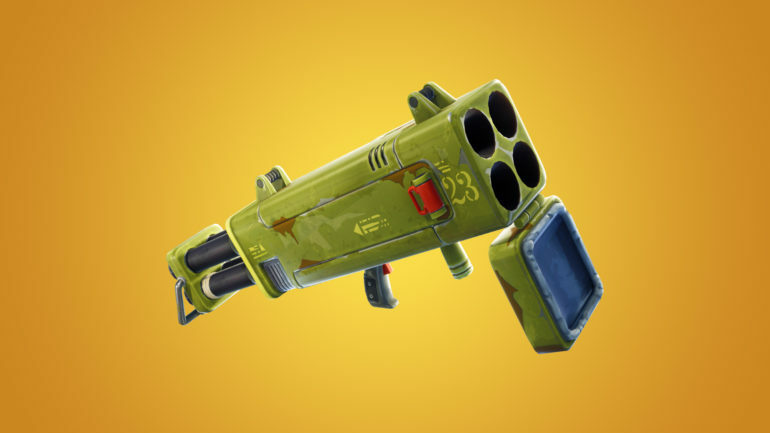 The Quad Launcher was first introduced in patch 6.02 on Oct. 10, 2018, and it instantly became a popular explosive weapon for players who like to shoot down opponents’ structures. Other changes that Williamson mentioned include “small tweaks to shield availability” and “a reduction of mobility (item and vehicle spawn chance).” Since Williamson said these changes are coming this week, they’ll likely go into effect tomorrow with the v7.20 content update, too. The new Sneaky Snowman item was also revealed to be coming soon this morning, so that could be another addition in tomorrow’s patch. Although it might just be labeled as a “content update,” it seems like a lot of changes are coming to Fortnite tomorrow.